Listed as one of the major risk factors to high cholesterol, obesity is also a contributor to heart disease. Obese people generally have high levels of triglycerides too and 20% of triglyceride value is factored into the total cholesterol level. Dieting can lead to weight loss and lower cholesterol levels. Not only should there be a reduction in calories, but the source and nutrients contained in the calories is critical. Up to a 4% reduction in cholesterol is possible by diet alone as found in a study of men with total cholesterol greater than 256 mg/dL. There are two major types of cholesterol that are measured in a normal blood test. The low density lipoprotein (LDL) cholesterol is considered the bad cholesterol. High density lipoprotein (HDL) is good because it helps removes excess LDL from the arteries. Obesity is a problem for many reasons, but one is that not only does it raise LDL (bad) cholesterol, but also it results in lower HDL (good) cholesterol levels. Learn how to eat right and get the right kind of exercise to lose weight and lower cholesterol without the use of drugs. 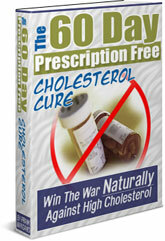 The information is found in The 60-Day Prescription Free Cholesterol Cure.